Sounds like a good Caesar dressing. I have four favorite knives: One is big and white and I got it at Sams. Perfect for cutting meat and veggies. One a steak knife, one a bread knife, and a nice stainless steel paring knife. Oh. And one cleaver. I guess that makes 5. I actually have duplicates of all except the cleaver, but they work great for me! Sounds like a good collection, Judy. Keep them sharp! I am hoping to start a knife collection by winning this beauty. Obviously I have something that cuts in the kitchen, but it's a version of a Walmart special from back in the day! Don't worry, other entrants, each person will have just one entry in the drawing (I would probably forget to include my email address and have to send a second email too!). We love a good sharp Wusthof knife and have several. But ... I can always use one more! 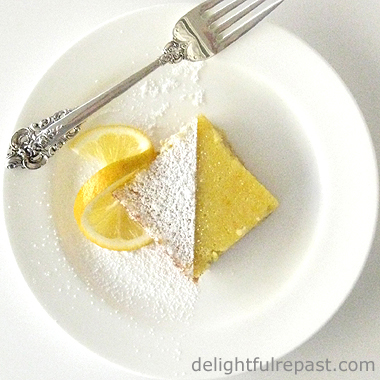 Love this recipe, and your blog - can't wait to explore more. I could use a good knife such as this one for preparing meals. I take my knives and kitchen tools super seriously. That's why I have a block with knives that I don't care about on the counter (for certain teenaged people and others to use) and a drawer with my 'real' knives in it. Right now it had linen dishcloths in it but I want to buy one of those in the drawer knife holder thingies. AnnaZed, we think alike! :D I have a place for knives other people can use and a drawer where I keep MY knives with blade guards. And, oddly enough, that draw also has in it linen dish towels I don't use! Amy, thank you for noticing the dressing! Jean's Delightful Caeserish Dressing; this is another must try! Oh knives... I had a lovely set of perfectly balanced knives which were sized for my (smallish) hands until we had a fire a few years ago. Now I make do with some which used to belong to my father, until I can find others which suit me. They are far too large for me to hold comfortably but I'm rather picky about my knives... This one sounds perfect! Jean, I am leaving this comment to replace my previous (I forgot to leave my email!). If you would, please delete my prior one. Thank you! I love your recipe and will have to try it, as Caesar-ish dressing is my favorite! I don't own a really good knife and appreciate the value of a well-engineered and sharp knife, and would love to own this one for my daily kitchen tasks. Love your Cesar dressing (with homemade mayonnaise, I guess?) Don't know about Wusthof..I still have some cheap knives..but usually use just one chef knife. Angie, thanks! I usually just use store-bought mayonnaise in the dressing. All hail Solingen! I have two excellent (and large) German knives that are great for some tasks, and two nice paring-size knives that were made by an historic knife manufacturer in the US. I use the smaller ones more often, multiple times daily, really. The Wustof giveaway design sounds like the perfect sep up from a narrow-bladed paring knife. My fingers are firmly crossed! Thanks, Nicole! I'm going to get organized and expand my garden next year. Yes, Quinn, I think you'll find it IS the perfect size knife! Um…let’s start off with 5 cleavers on account of you don’t give anything less to someone talking about knives and saying stuff like, “…I could chop for hours.” Cleavers vs. knives – no contest. Knives win. I gave up trying to find good ones years ago, BTW. Now I just have a woodblock with 5 ordinary ones in them and when they go dull, I give them a couple of passes on an electric stone grinder, problem solved. And though we already know where I stand with veggies (or vice versa), I see you achieving instant fame with your assembly. Will dutifully watch for the TV ad: “You’ll want to seize her Sorta Caesar Salad to avoid a seizure of the cardio variety.” Or something. I have a couple of knives, small ones that I like. Both steel, that rusts, so I have to dry them immediately after use. 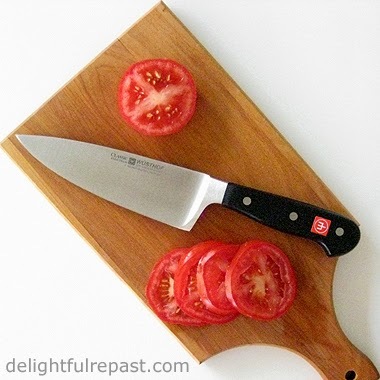 They are great in that they can be sharpened, and so can always cut a tomato! Joanne, I think you'll find the high carbon stainless steel much easier to care for, though I always hand wash and dry my knives promptly, just to be on the safe side! I recently upgraded to a beginner set of "CLASSIC" Wusthof knives after researching the heck out of them. Don't have a 6" one though! I read EVERY review on Amazon, in Chef's Catalog, William Sonoma etc. Didn't know about your Blog then:) I went down to a retail store to compare Henkels with Wusthof. I drove the clerk nuts insisting on holding each type of knife. Wusthof was the clear winner. The Classic is heavier than their other models and as you say perfectly balanced. I now guard my knives like they are gold. People laugh at me! I bought a new thick Boos Cutting Board just so I wouldn't wreck my knives. I plan on adding on asking for specific knives for XMAS & my Bday. Thanks so much, Vixter! You sound like me - just researching the heck outa something! :D Did you see the posts about the 8-inch, the bread and paring knives? I have been really wanting to try out a Wusthof knife! I hear only good things about them! My knives are a mess, it's a huge mish mash of knives. It would be nice to have a new one. Jennifer, yes, I do like this wide blade. It's as wide as blade on the regular 8-inch chef's knife (and I think the blade on the extra-wide 8-inch is as wide as the blade on the regular 10-inch, etc). This is not a light knife, but it's so well-balanced it seems lighter. I have a chef's knife and a shorter santoku knife. They're pretty great - although my spouse and I find ourselves passing a knife back and forth because the other one is dirty. Thank you so much for visiting. I have never seen your blog before, but after reading through, I will definitely add you to my list. This knife sounds like a great thing to win -- who wouldn't want a great new knife? I just realized that I didn't have to enter my email to post a comment -- that's very unusual. Thanks, Scribbler. So glad you like it. I need a new knife -- you should see the motley collection of knives I have. Most of them won't cut butter. Carolsue, I know what you mean! I was helping a friend (who is a very good cook) with a meal at her house and was astonished at her "motley collection" - like yours, her knives wouldn't cut butter. I went out and bought her a knife and a blade guard so next time there'd be a knife I could use! 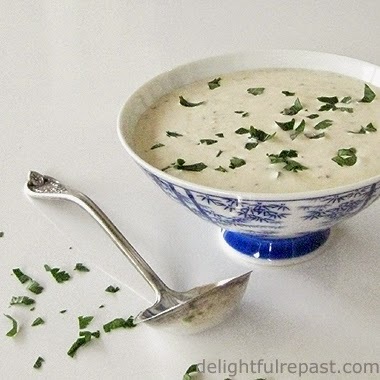 Love this creamy dressing and the name! "Goldilocks" - love it! Yes, I think this size is perfect. Especially when held (I'm sure the grip has a name, I just don't know it) pinching the blade between the thumb and index finger just in front of the handle. Oh, Laura, you would (will?) love this knife! *Giveaway Winner Announced* - The winner, by random drawing, of the Wusthof Classic 6-Inch Extra-Wide Cook's Knife is Jacquelineand. Jacquelineand, as soon as you send me, delightfulrepast at aol dot com, your name, address and phone number (required by shipper), Wusthof will ship the knife to you. Congratulations! If I don't hear from the winner of the random drawing by 11:59 am Eastern time Sunday, July 13, another drawing will be held and a new winner selected from among the original entrants (those who commented before the giveaway deadline). Watch for my next giveaway! In the meantime, follow me on Google and Twitter (@delightfulrepas) and Pinterest. You can even use the Follow Me By Email button in the right column so you never have to miss another recipe, review or giveaway. Thank you Jean! I've replied to your email and, if you couldn't tell, I'm SO excited! Oh those tomatoes look yummy. Deb, how funny! I thought it was only men who ruined knives using them as tools (yes, I'm still holding a grudge about a ruined paring knife years ago)! But, seriously, *this* is THE Knife to have. Am I missing something? Who won? AnnaZed, as with all my giveaways, "Winner will be announced here in the comments before noon Eastern time on Thursday ..." If you look a few comments above the last one, you'll see a long comment from me that starts with *Giveaway Winner Announced. * Maybe you'll win the next one! Not sure yet what it will be, but it's always something good! Jean, ::Duh! :: I was indeed missing something. What a charming blog and a wonderful prize, thanks. AnnaZed, thank you for letting me know you got my reply! I was just wondering! Be sure to get in on the next one -- I don't know what or exactly when it will be, but it's always something really nice. Your caesarish dressing sounds perfect to me! I love making homemade dressing and can't remember the last time I bought any. Jen, thank you! I hope you'll try it soon and let me know how you liked it. I'm with you - I never buy bottled or packaged dressings.